From the Cumberland Gap to the Atlantic Ocean, this is Virginia Water Radio for the week of February 9, 2015. As of February 10, the clock was ticking down on the time left for the Virginia General Assembly to consider over 2700 bills in the 2015 session. Over 100 of those bills concern water resources directly, or may affect water indirectly through energy, transportation, or other land uses. Now here’s YOUR chance to imagine being a member of the General Assembly and consider how you’d vote on some water-related bills, recognizing, of course, that you’d have much more information if you actually were a member. I’ll give you brief descriptions of four water-related bills, then a couple of seconds to decide if you would vote for the idea or against it. Then I’ll sound a bell [BELL SOUND] if the bill was still alive as of February 10; or a buzzer [BUZZER SOUND] if it had essentially failed. Ready? Senate Bill 1317 would establish the Virginia Shoreline Resiliency Fund as a low-interest loan program to help residents and businesses that are subject to repeated flooding. [SOUND - CLOCK THEN BELL] The bill passed the Senate and moved to the House. House Bill 2205 also would establish a fund to help with repeated flooding, but, in addition, it would also require Virginia to participate in the carbon dioxide emissions cap-and-trade program known as the Regional Greenhouse Gas Initiative. [SOUND – CLOCK THEN BUZZER] The bill failed in the House Commerce and Labor Committee. Senate Bill 1338 would repeal Virginia’s current law that allows natural gas companies to do surveying work on private property without landowner permission. [SOUND – CLOCK THEN BUZZER] The bill failed in the Senate Commerce and Labor Committee. Senate Bill 1103 would allow localities to ban disposable plastic shopping bags, with certain exceptions, in order to reduce litter and waterway pollution. [SOUND - CLOCK THEN BELL] The bill passed the Senate and moved to the House. Obviously, this short game can’t capture the scope of the General Assembly’s potential impact on a subject as complicated, connected, and vital as water. But the online Virginia Legislative Information System provides details on these and all General Assembly bills, and part of every Assembly member’s job is to help their constituents be informed and express opinions about legislation. The 2015 General Assembly is scheduled to adjourn on February 28, so the clock’s also ticking down on Virginia citizens’ chances to influence this year’s bills. Thanks to Soundbible.com for making the ticking clock sound available for public use. 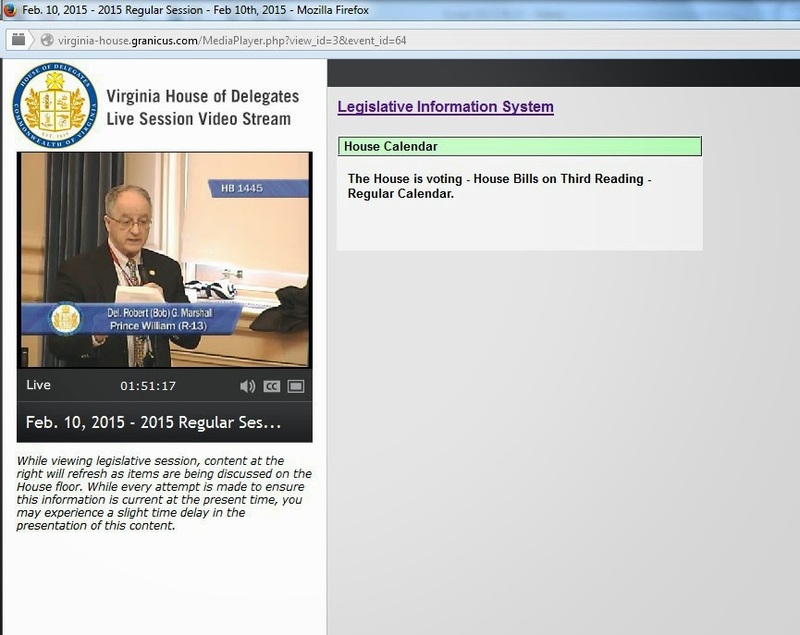 Screen-shot from live-streaming video of the Virginia House of Delegates floor session on February 10, 2015, accessed online at http://virginia-house.granicus.com/ViewPublisher.php?view_id=3. Live-streaming video of Virginia Senate floor sessions is available online at http://virginia-senate.granicus.com/ViewPublisher.php?view_id=3. The ticking clock sound was recorded by Kevin GC and made available (10/25/10 upload) online at the Soundbible.com Web site, http://soundbible.com/1580-Ticking-Clock.html, for public use under the Creative Commons “Public Domain” dedication. For more information on Creative Commons licenses, please see http://creativecommons.org/. Thanks to Eli Archer, a Virginia Tech junior in Geography, for his assistance in choosing bills to highlight in this episode. Legislative Information System (LIS) Web site, http://leg1.state.va.us/; for session statistics (number of bills introduced, passed, failed, etc. ): http://leg1.state.va.us/cgi-bin/legp504.exe?151+oth+STA. Bill letting local cities and counties ban plastic bags may be boon for cotton farmers, [Newport News] Daily Press, 2/5/15. General Assembly notebook: Natural gas pipeline bills die in committee, Lynchburg News & Advance, as published by Roanoke Times, 2/9/15.No cap and trade for Virginia; Dominion gets way on energy, [Newport News] Daily Press, 2/4/15. Pipelines prompt discussion of property rights law, Roanoke Times, 1/21/15. General Assembly Web site, http://virginiageneralassembly.gov/: this site offers several useful features, including member lists, session calendars, links to the live video of floor sessions, and information on legislative processes. Virginia Legislative Information System, at http://leg1.state.va.us/: online location for following the legislation of General Assembly sessions. Virginia Water Central News Grouper posts on the Virginia General Assembly: online at http://vawatercentralnewsgrouper.wordpress.com/?s=General+Assembly. For 2015, see particularly this post: Water in the 2015 Virginia General Assembly – Compilation of News Articles on Bills Related to Water Resources. Virginia Water Resources Research Center’s “Virginia Water Legislation” page, online at http://www.vwrrc.vt.edu/virginia-water-legislation/: inventories of water-related bills in the current and previous sessions of the General Assembly. This episode may help with the Virginia Standards of Learning (SOLs) listed below. Information about Virginia SOLs is available from the Virginia Department of Education, online at http://www.doe.virginia.gov/testing/index.shtml.